The Government of Timor-Leste, represented by the Minister of State for Foreign Affairs and Cooperation of Timor-Leste, Jose Luis Guterres, the Minister of Education, Bendito Freitas, and the Minister of Justice, Dionísio Babo, signed on July 21st several agreements with the Government of the Republic of Cape Verde and the Government of the Democratic Republic of Sao Tome and Principe, represented respectively by the Minister of Foreign Affairs, Jorge Borges da Silva, and the Minister of Foreign Affairs, Natália Umbelina Neto. After the bilateral meetings, Timor-Leste and Cape Verde signed an agreement on visa exemption for ordinary passports; an Agreement on the establishment of a mechanism for bilateral consultations and a Memorandum of Understanding on Educational Cooperation between the Ministries of Education on the Educational Cooperation program. The agreement on visa exemption for ordinary passports applies to citizens of both countries (Timor-Leste and Cape Verde) that travel for tourism, visit and business for a period of 30 days, which can be extended. The Agreement on establishment of bilateral consultation mechanism arises from the desire to promote and strengthen bilateral relations on regional and international issues of common interest. The Memorandum of Understanding on Educational Cooperation program is the cooperation framework, which integrates the projects to start or already underway in the area of Education, Higher Education and Science. 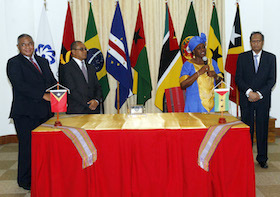 According to the Minister of Foreign Affairs of Cape Verde, "the Agreements signed today allow greater movement of culture-makers, academics, thinkers and others. Cape Verde invests in developing human resources and, as we have some experience in this area, we can share it with our brothers in Timor-Leste". Between Timor-Leste and Sao Tome and Principe was signed a General Cooperation Agreement; an Agreement on Justice and also a Memorandum of Understanding between the Ministries of Education on the Educational Cooperation program. In the General Cooperation Agreement the two countries intensify their relations in the economic, social, cultural, scientific and technical fields. The Agreement on Justice lays down rules relating to bilateral cooperation in this area. Finally, the Memorandum of Understanding on Educational Cooperation program is the cooperation framework, which integrates the projects to start or already underway in the area of Education. After the agreements were signed, Natália Umbelina Neto, Minister for Foreign Affairs of Sao Tome and Principe said, "more than signing, you need to stick to them so that they can have effects on our society and in our population. We are available to assist in the training of teachers of Portuguese for basic and secondary school education and where needed".